The aim of the Euro-Asia Summer School ‘EU - East Asia Bilateral and Multilateral Cooperation in Global Governance’, organized by the Leuven Centre for Global Governance Studies in association with Hitotsubashi University (Japan), Seoul National University (South Korea), the KDI School of Public Policy and Management (South Korea) and the Institut Barcelona d'Estudis Internacionals (Spain), is to bring together talented students from Asia and Europe to study key aspects of global governance from comparative perspectives. This is a key opportunity for young talents to meet and interact and therefore to facilitate inter-cultural dialogues on global governance. Requested documents are: a detailed CV, motivation letter, copy of academic transcripts and proof of English language skills. Academic merits and motivation will be taken into account during the selection. Students wishing to apply for a scholarship are requested to state this in their motivation letter. European and international students who are interested to participate in the summer programme will need to apply through the Leuven Centre for Global Governance Studies. Your contact person is Ms. Marta Hermez: marta.hermez@kuleuven.be. Korean students who are interested to participate in the summer school will need to apply through the Graduate School of International Studies (SNU). Your contact person is Prof. Sunhee Park: europaparksh@snu.ac.kr. The applications deadline for scholarships is 15 May 2019. The final selection will be communicated by 1 June 2019. Participants are Bachelor and Master students from Korea, Japan and Europe. 30 students are supposed to attend the summer programme. 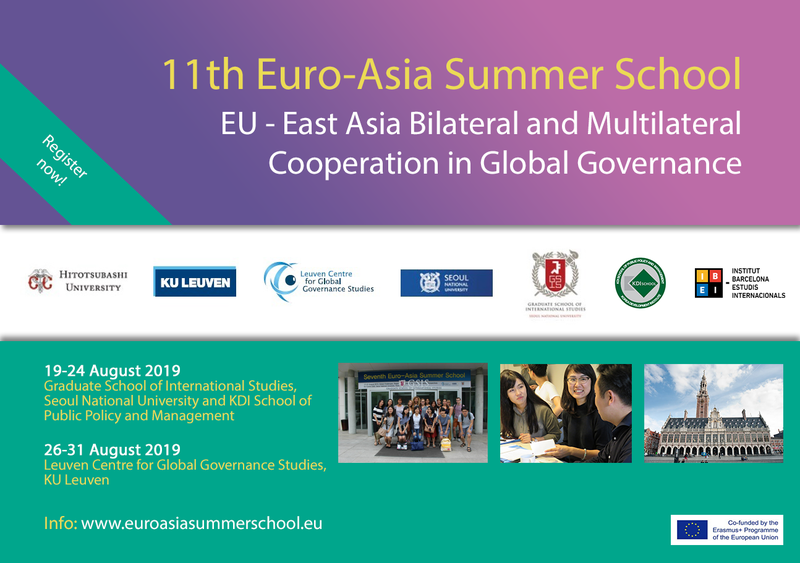 For the participants in the Summer School, a certificate of Seoul National University and the Leuven Centre for Global Governance Studies will be awarded. We ask all participants to stay in guest houses (or hotels) in Seoul and Leuven. Breakfast and lunch during class days will be provided. Participants need to make the necessary arrangements if they are required to obtain a visa. Please visit the travel information website of the country of your nationality. The participation fee for the program is 500 EUR. This includes accommodation, half-board and domestic travel. Application for mobility scholarships should be motivated together with the overall application by the applying students (including a detailed CV, motivation letter, copy of academic transcripts and proof of English language skills) by 15 May 2019. Applicants will be notified about the results by 1 June 2019. Participants have to make their own international travel arrangements. Students must ensure to have adequate travel and health insurance.